mybestfit Full Body Scanners Help You Find The Perfect Size | OhGizmo! One of the things I hate about clothes shopping is actually having to try things on in a cramped changing room. It would be nice if one size from one store fit as well as the same size from another, but that’s just not the case. And even though sizing may never be standardized, there’s still hope that clothes shopping doesn’t have to be as torturous as I find it to be. mybestfit is a free full-body scanning service that provides you with a handy guide as to what size of clothing you’ll need at specific stores or brands like Levi’s, Eddie Bauer and the Gap. Instead of lasers, which I’m sure some people would be uncomfortable with, the scanning booth uses a ‘vertical wand’ array of 196 antennas that rely on radio waves to build up a 3D model of your body as it encircles you in about 10 or 15 seconds. (Amassing 200,000+ points of data.) From there your body shape and size is used to create a ‘mybestfit Shopping Guide’ telling you what size to choose for your favorite brands, hopefully making your shopping experience a little easier. 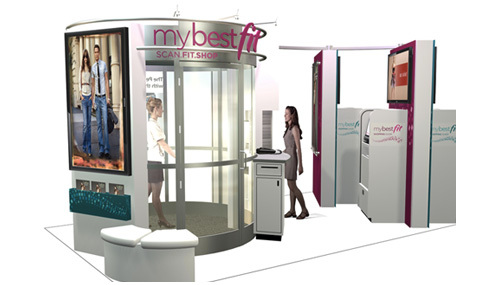 At the moment the only mybestfit scanner listed on the company’s website is in Pennsylvania, but hopefully more will be popping up in the near future… like specifically at the malls where I shop… I hope. Reminds me of the shoe-fitting x-ray machines that where highly dangerous and outlawed. Another dose of radiation please…..